Our extensive, user-friendly CMS has a multitude of built-in features to help you deliver your content. You remain in complete control while providing a great user experience. Set up multiple users to add or edit content, each with their own individual set of permissions. Best of all, there's no special programming knowledge necessary to update your website. No more waiting around for your web programmer to add your news and events - you can do it yourself with easy online forms. Updates to your web and mobile applications happen instantly! The CMS is accessible from anywhere. All that's required is an internet connection. No software or hardware needs to be installed on your computer. Set up an number of users to have access to your CMS, with individual log in credentials and permissions. If you can fill out an online form, you can update your content. It's as easy as that! All screens have integrated help buttons beside each form field to help you fully understand your options. There are also instructional videos available and PDF documentation to walk you through how to utilize the CMS to its fullest capabilities. New functionality and capabilities are built into the CMS regularly. These updates are rolled out to all users on the system with no interruption to performance. 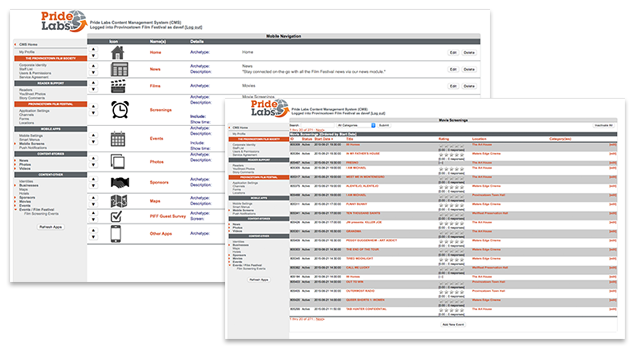 Whether you have a simple question or need personalized training, the Pride Labs Team is always ready to lend a helping hand - whenever and wherever you need it!